10 Things People Waste Time With - Motivate Amaze Be GREAT: The Motivation and Inspiration for Self-Improvement you need! The clock keeps ticking, what are you doing? Are you running the day? 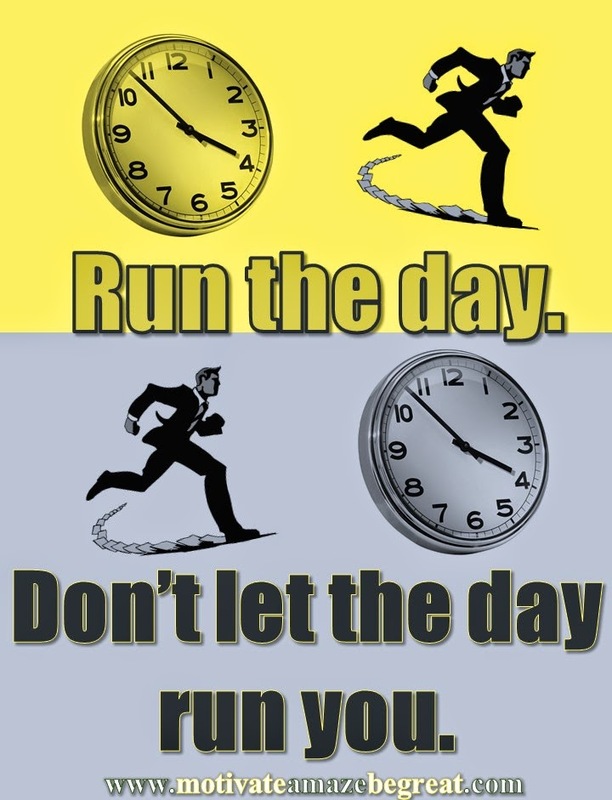 Or is the day running you? Time is a crucial factor when it comes to being successful, specially the way you manage your time. It's very important that you use the time you have, to do the things you need to do, in order to succeed. You don't have all the time in the world to become successful. Unfortunately, people lose too much time with things that really don't matter, and that's a real problem! We cannot make up time for it, once we lose it, it's gone! It's not coming back. Either we use our time correctly or we are wasting it. We all been there, at the mall buying products that are indispensable at that particular moment, but soon as we arrive home they get thrown into the closet to never come out ever again. But, more incredibly we do it again and again, because, the feeling of buying something new, gets the best of us. We need to prioritize, buy only what is really indispensable, get serious about it, be honest with yourself and your time. We can't change anything about the past, so it's really pointless hanging on past memories. If we have regrets the only way we can do something about it, is to live in the present, making sure we don't make the same mistakes. Learn with the past, don't live there, don't waste your precious time on the past, use it now in the present to create a better future. Envy will get us nowhere. Be satisfied with what you have, learn to give value to your own things. Its futile to want materialistic things that bad, to the point of envying. Get ride of it, it will make you a much happier person, and we will not be wasting time doing things that only leave you in a bad mood. The purpose of an argument it's not to win the fight but, to reach the best possible conclusion with people having the right to show their points of view. So, if you are in an argument just for the sake of winning, you are losing your time. Because, you will not get the best conclusion possible, and consequently you will not grow as a human being. We all are different, what fits for me could not be the best fit for you. In that sense, it's pointless to compare your life to others, most likely it will be different, of course! You have your dreams and goals, people have their dreams and goals, your neighbor could be achieving things you don't achieve, but who cares? You don't want he wants, you want different things, stop comparing. Don't waste time with something that is natural and it's just the way things are. Accept your uniqueness and make the best out of it. If people don't make time for you, they don't see as a priority, in fact they just tolerate you, why in the world should you make time for them? Stop making yourself miserable trying to please that person. If you are being truth to yourself and your values, but still, that person doesn't celebrates you and your authenticity, do yourself a favor, don't be with that person no more. Stop wasting time with that kind of people, not only you will lose time, but also they will influence you to stop being you. Get ride of toxic people. Excessive worrying it's like imagining what's inside a black box not having a clue about it. You can imagine whatever you want, but the more time you think about it, you will change your mind, you could be lost in infinity possibilities, and worst...wrong possibilities. That's what you are doing by worrying about things you really don't know or lack the necessary knowledge. It's really pointless to worry, it will make you fearful, and you'll be losing precious time that could be use in more important things. Don't waste time looking for gimmicks to instantly look good. There are no gimmicks in physical activity. People go trough ab product to ab product looking for something that they never will find. Stop wasting your time in this endless route. Face it, working out it's much more than looking good, embrace all the benefits (from health, aesthetic, social and psychological stand point), go for the full experience. Don't waste time with gimmicks, gain quality time, and much more, with great workouts. Emotions come and go, they are always in motion. They are not eternal, they are not here to stay, so why should we let them control what we are doing? It's like having a guest that doesn't sleep in your house, decide what kind of bed you should sleep on. It's dumb right? That's what you do when emotions get the best of you, you let a guest make decisions about your life for you. Don't let this happen, you are wasting time with it. Control your emotions by remembering your purposes in any given situation. People waste an entire life trying to please others, being what is comfortable to others, having the ordinary job that just pay the bills, having a car they don't like, living in the neighborhood they don't want, why? Because they are just existing, they are not living. Living life to the fullest, daring to dream, be uncomfortable enough to reach the extraordinary, have everything you truly want and deserve. Don't waste time just surviving, merely existing, make the best of your life by living it.